Obituary for Kathleen "Kathy" Shagonaby | Stone Funeral Home, Inc.
Kathleen "Kathy" Shagonaby, 75 of Harbor Springs, walked on December 3, 2018 in Petoskey, Michigan. Kathy was born on May 6, 1943 in Harbor Springs, the daughter of Charlie and Susan (Kiogima) Shagonaby and was raised in Harbor Springs. She moved to the Grand Rapids area in the late 60's. She received her Master's Degree in Social Work and went to work with Child Protective Services for a time before going to work for the 61" District Court as a Probation Officer and Alcohol and Drug Therapist. Even after she had retired, she was always on an AA outreach, and was willing to drop everything and help those in need and always said she was there to: "serve her fellow man". In 2008 she returned to Harbor Springs and could be seen daily walking her dog, Kada, downtown Harbor Springs. Kathy dabbled in gardening and expanding her green thumb, enjoyed playing BINGO, going to the casino, and dancing. She loved books and was an avid reader, but her greatest love was her family and spending time with them. She was an amazing woman and was very proud of her heritage. She acted as a Docent for the Blackbird Museum and was a teacher/dance instructor for the Hiawatha Pageants. 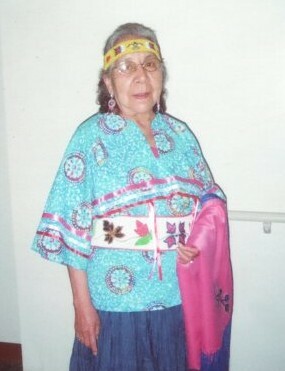 She was a member of the Little Traverse Bay Band of Odawa Indians and the Holy Childhood Parish. Kathy is survived by 6 children, Carolyn Sue (Henry) Medawis, Susan (Amos) Day, Fred Shepard, Mike (Roxann) Shepard, Sharyl (Scott) Jones, and Travis (Tera) Shepard; brother, Robert Wayne (Joyce) Shagonaby; special friend, Bruce Reick; 22 grandchildren and numerous great grandchildren and nieces and nephews. She was preceded in death by her parents; grandson, Dylan Paul Dayson; and by 7 siblings. A funeral Mass will be held on Saturday, December 8th at 11am at the Holy Childhood Catholic Church. The family will receive friends at the church on Saturday from 10am until the time of service.